Archimago's Musings: MEASUREMENTS: Apple iPhone 4 & iPhone 6 audio output. MEASUREMENTS: Apple iPhone 4 & iPhone 6 audio output. In terms of general look-n-feel, or usability of the product, there's nothing I can say here that has not been said about Apple's most popular devices - the iPhones. Though I'm not an Apple fanboy, my wife loves the Apple "ecosystem" and has been using an iPhone and Mac combination since the release of the iPhone 3G in June 2008. There is no question that Apple produces some amazing devices focused on usability and pitched as lifestyle products. With enough financial resources, they can of course fund research and compete in the specifications arena as well. In the last few years they did fall behind on screen real-estate but it's good to see that with the iPhone 6, they're making headway in this area as well... This should really give the Android makers like Samsung some good competition in the Asian arena where logosyllabic writing systems predominate and a larger screen size is almost a must. As you can see, this is the "gold" colored version of the regular 4.7" 64GB model (versus the 5.5" 'plus' model with the much-publicized bending tendency). I think the gold color looks nice - at least a little different from the usual silver or white and I'm sure this will sell well in Asia also. Not that it really matters much because if you use a case, the back will be covered anyhow (although the gold trim around the home button looks nice). Notice the camera lens protrusion. Some have commented that this looks bad. Indeed, it will prevent the unit from lying flat and it will "tip" somewhat. Again, it doesn't really matter if you use a back cover. I'd consider this a small cosmetic price to pay for better focusing mechanism, larger aperture, and optical image stabilization (the DxO folks rated the camera function very well). As you can see, my almost-1-year-old LG/Nexus 5 phone on the right is a little larger with a 5" screen. 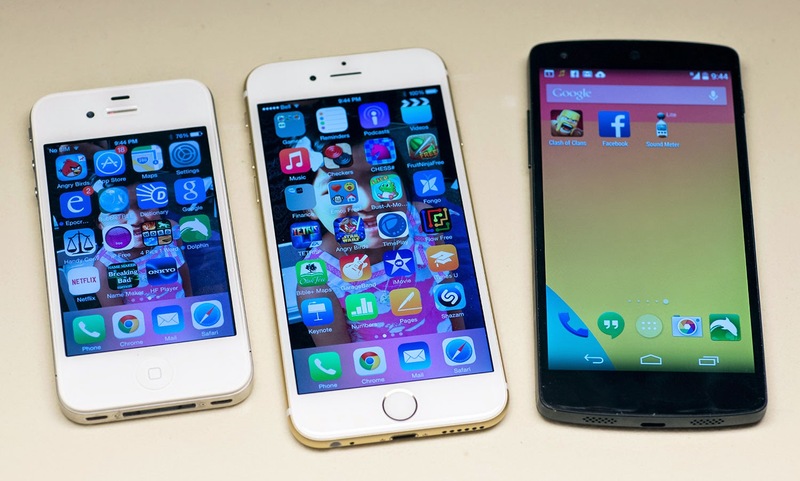 But check out how thin the iPhone 6 (middle) is compared to the iPhone 4 (left) and Nexus 5. The iPhone 6 feels great in the hand. The rounded corners make it comfortable to hold and it's light but still feels solid. No, I did not try bending this thing :-). One other thing to notice is that the headphone jack is now at the bottom of the phone. I find this less intuitive than the previous top-left placement. In use, well, it's an iPhone :-). Runs all the usual apps, nice bright "Retina" screen (all modern 'premium' phones have excellent resolution these days anyhow), very snappy with the A8 1.38 GHz dual-core processor, 1GB of DDR3 RAM (modern Android phones have 2-3GB already). I'm curious what this M8 "motion coprocessor" will bring to the table in terms of future apps (funky 3-axis gyro, accelerometer, proximity sensor). It's interesting after all these years, I have seen few measurements of the sound quality out of these ubiquitous devices which I suspect has taken over the role of the iPod for music playback for many if not most Apple consumers. So without further ado, let's have a look at the output of both the iPhone 4 and 6 to compare and contrast what has happened in the objective measurements of these devices two "generations" apart. iPhone 4 - 1kHz square wave 0dBFS. iPhone 6 - 1kHz square wave 0dBFS. As you can see, the "square" wave tracings are very similar. Neither phones show any clipping (I confirmed with sine wave as well - not shown). The iPhone 6 is marginally "louder", putting out 1.4V versus the 1.3V from the iPhone 4. Channel balance is excellent on both machines. Okay, let's now get to the usual RightMark 6.4.0 measurements. Screen brightness ~50%. These measurements were made with the iPhone 4 connected to my home WiFi router (no SIM card inside) and the iPhone 6 has my wife's SIM card inside and with cell phone and HSDPA data activated. I made no concessions for "better sound" since I don't believe people listen to these devices in a crippled fashion without data connection. 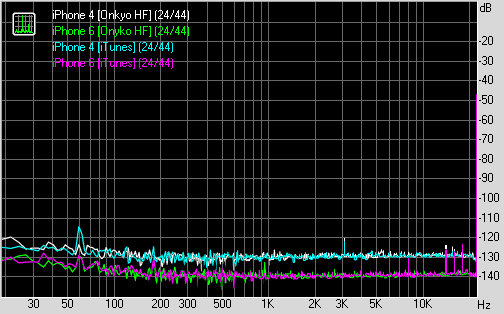 I used the latest ONKYO HF Player (1.2.1, $10 for the hi-res features and FLAC playback) to play the test files. 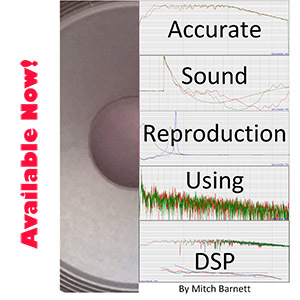 No EQ or any other DSP process like upsampling applied for the test signals of course. I promised folks that I would try measuring the effect of various loads from the headphone output... Alas, I haven't found the time to get this together. Therefore, I'll just give you the results off the E-MU and will update with another post when I get some 30/100/300-ohm load measurements done. As you can see, the little iPhones hold their own in terms of 16-bit accuracy. As with most devices, 16-bit, 44kHz audio is not an issue these days and all competent devices would have no problem decoding this most basic bit depth and samplerate. Slightly more high frequency roll-off with the iPhone 6. 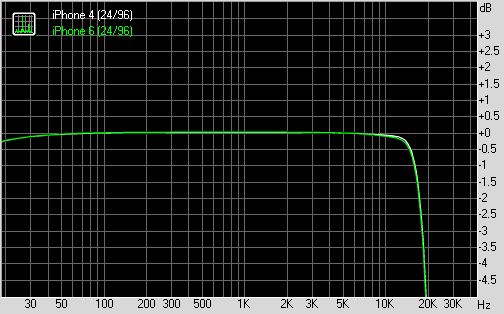 -0.5dB at 20kHz. Noise level: All pretty close, Nexus 5 slightly noisier. Stereo crosstalk: other than the TEAC using stereo RCA connectors, the others all using the same shielded 3' phono-to-RCA cable. The Dragonfly v1.2 has notably higher crosstalk. Okay, let us now go one step up into high-resolution territory. Can the iPhones manage better than 16-bits? The answer is YES, the iPhone 6 is clearly capable of better noise floor and dynamic range when fed with 24-bit data. The measured performance is between 17-18 bits of dynamic range... Not bad for such a compact device and about on par with the AudioQuest Dragonfly 1.2 previously measured. Since I don't normally measure 24/44 with my other gear, I don't have comparisons in the table to other devices. I measured the audio output using either the Onkyo HF player (FLAC files) or the Apple iTunes built-in "Music" app (AIFF). As you can see, the iPhone 4 functions as a 16-bit device in terms of noise floor and dynamic range performance when fed 24-bits. 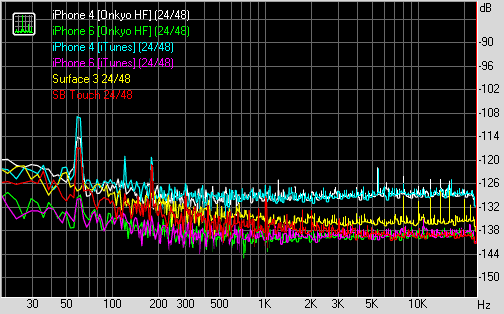 It benefits very slightly with 24-bit audio - at best 3dB improvement. Notice that there isn't any real difference between the Onkyo app and standard 'Music' app. Just remember to turn off any EQ feature to make sure it's bit-perfect (I noticed the iPhones Music app had set the EQ to "Classic" or something like that by default; I don't know if this was a setting my wife had previously set). iPhone 6 benefiting from the 24-bit data compared to the iPhone 4. Again, we see that there is essentially no difference between different music player apps on the iPhone (Onkyo HF Player vs. standard "Music" app linked to iTunes). This time I've included 24/48 results from the recently measured Microsoft Surface 3 laptop, the Squeezebox Touch, and a couple of USB DACs - the AudioQuest Dragonfly 1.2, and AudioEngine D3. Note that the Dragonfly and AudioEngine D3 were measured at 24/96 and I mainly wanted to demonstrate the noise floor performance. In terms of harmonic and intermodulation distortion, the iPhones perform well; the only "atypical" performer in terms of distortion is the Dragonfly. 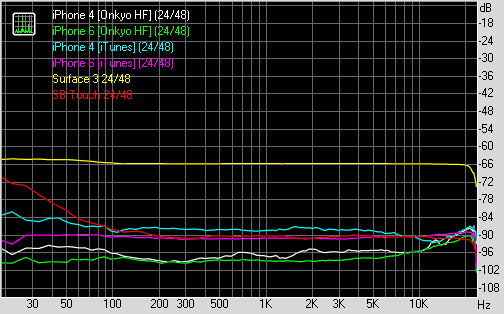 In short, I am impressed by the low noise level and high dynamic range achieved by the iPhone 6's internal DAC! 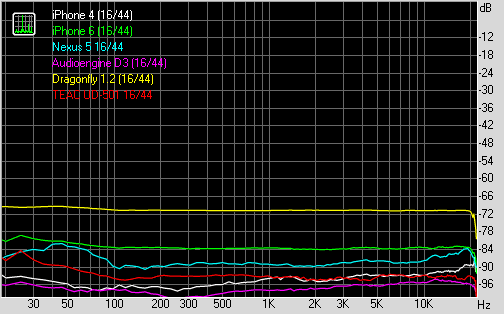 It's getting really close to the AudioEngine D3 in terms of low noise which is superb. Frequency response: Squeezebox Touch seems to have more of a bass roll-off. Noise floor. 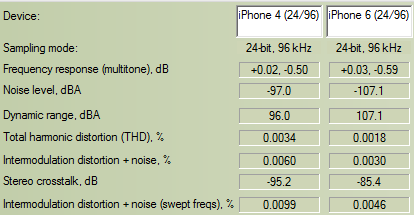 iPhone 4 unable to benefit significantly from 24-bit audio. Stereo crosstalk: Microsoft Surface 3 worst of the bunch here. Neither iPhones are capable of native 96kHz samplerate and the data has been re-sampled down to either 44kHz or 48kHz. 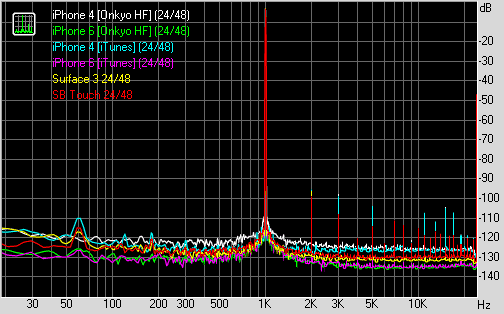 The J-Test audio track was played off the iPhones with Onkyo HF Player for this measurement. A bit more jitter noted with 24-bit data for the iPhone 4 (sidebands and wider "skirting"). Also notice the iPhone 4 has higher noise level so the jitter modulation pattern in the 16-bit test is not as evident compared to the iPhone 6. Like essentially all decent hardware measured over the last while, it's hard to make a case for jitter being an audible issue given how low the distortion is; typically way below -100dB off the primary signal. 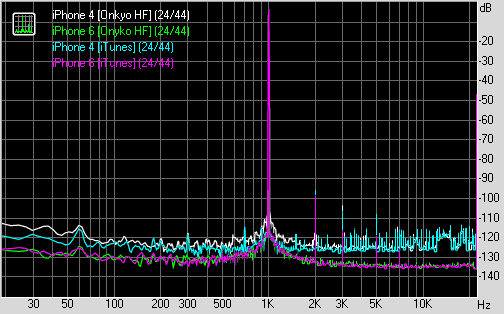 The jitter spectra look the same whether I used the "Music" app or Onkyo HF Player; again, a reminder that software does not affect jitter performance as far as I can tell whether with these portable devices or with computer audio. Remember that this is even with either WiFi or HSDPA wireless data turned on. iPhones are everywhere, go listen for yourself :-). Heck, bring in your favourite headphones and have a listen at the local Apple Store. Be that the case, I did of course listen to both the iPhone 4 and 6 with my headphones here at home. I really could not put a finger on any significant sonic difference between the two phones so spent most of the time listening to the iPhone 6. What is most obvious using less efficient headphones like the AKG Q701 is that the headphone amp just isn't strong enough - no surprise there. 100% volume is merely 'loudish' with both the AKG and Sennheiser HD800. One effect of this is that bass frequencies requiring a bit more "oomph" just does not sound impressive using either headphone. The iPhone 6 comes with the newer EarPod headphones with volume control. These sound better than the old earbuds from previous generations before the iPhone 5. They do feel more comfortable as well in the ear. But there's no denying that these don't sound that good with mediocre treble definition and muddy bass obvious within a few seconds after listening with the Sennheiser HD800. I listened to both lossy 320kbps MP3 encoded with LAME and AIFF lossless music. The music sounds great using my Sennheiser HD800. Typical audiophile female vocals like Jane Monheit's Come Dream With Me sounded wonderfully detailed with vocal nuances intact. With the iPhone 6 plugged into my AudioEngine A2 speakers for "near-field" listening, the soundstage was excellent and voice well focused. The classic Miles Davis Kind Of Blue sounded nice and warm as it should - nothing was missing, including the elevated background noise and ambient sounds (is that someone clearing his throat 9 seconds into "So What"?). Mark Knopfler's Privateering sounds excellent with multi-layered strings, percussion and vocals on the title track. Loud tracks like Joe Satriani's "Crowd Chant" from Super Colossal (a dynamically compressed DR8 track) sounded fine with the phones capable to rendering details through the "mass" of vocals and playful guitar-voice interchange. More efficient headphones like the closed back Sony MDR-V6 or Audio-Technica ATH-M50 provide plenty of volume and as typical for headphones of this nature, the bass also takes on a more visceral property despite giving up a bit of detail compared to something like the HD800. Apple is without question the "800lb gorilla" of the music industry whether we're talking about music downloads or potentially the future of streaming audio. As a family of audio devices, the iPhone is arguably the most important music player in the world at this point in time. 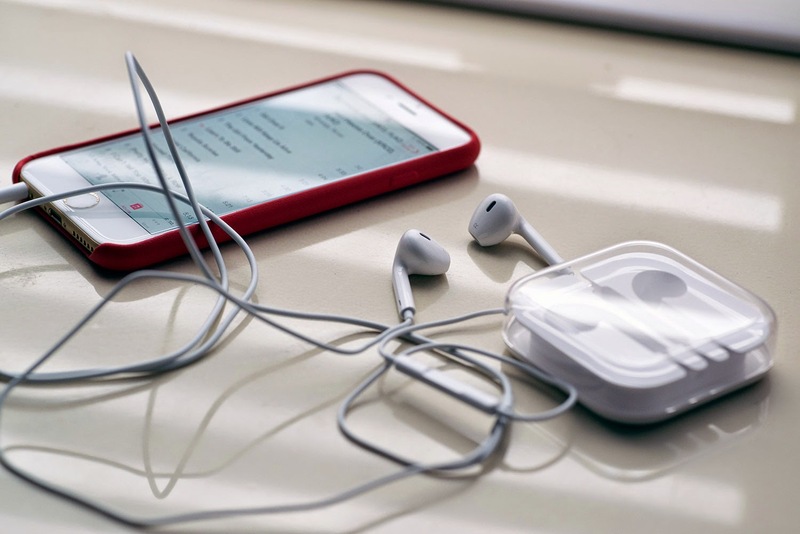 iPhones continue to be a point of entry in portable audio given the popularity. As I publish this post, I see the iPhone 6 is up for pre-order in China today; no doubt Apple will sell massive numbers there despite the higher price point compared to competitors. While I cannot speak of the iPhone 5's audio performance, there has obviously been an improvement between the iPhone 4 to 6 with the ability to play 24-bit audio. 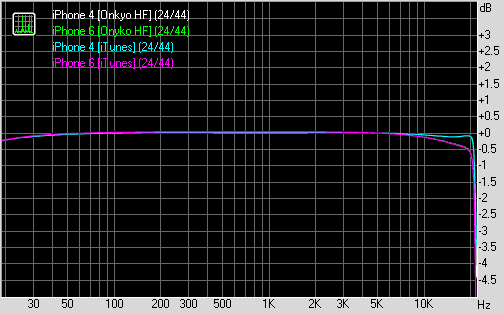 The iPhone 6's DAC measures very well up to the maximum 48kHz samplerate. Furthermore, I was surprised that Apple has been using a minimum phase digital filter at least since the iPhone 4. Not that I really feel it makes much of any difference, but the iPhone can claim "no-pre-ringing" just like the Pono/Ayre folks might claim. Of course, with a typical minimum phase filter like we see here, there is quite a bit of post-ringing. The Ayre folks dampened that with a -6dB at 22kHz slow roll-off filter which IMO isn't necessarily a good thing if you want flat frequency response all the way to 20kHz. As I mentioned at the start, I unfortunately have not had the time to start measuring using various simulated headphone loads to demonstrate frequency response anomalies especially with low impedance headphones. Ken Rockwell's review of the iPhone 5 puts the output impedance at 4.5 ohms which is excellent! Hopefully the iPhone 6 will be similar in this respect. 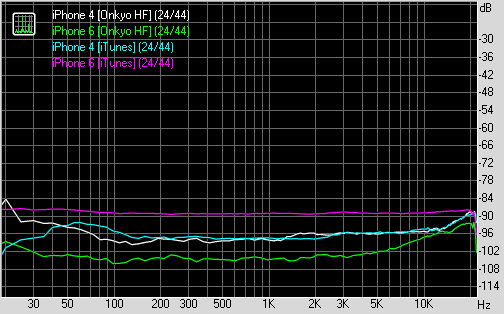 Given the measurements I'm seeing, the iPhone's DAC is excellent and can produce very accurate output. Given the small form factor and the need to balance power usage with other phone functions, headphone amplifier power is limited out of necessity. 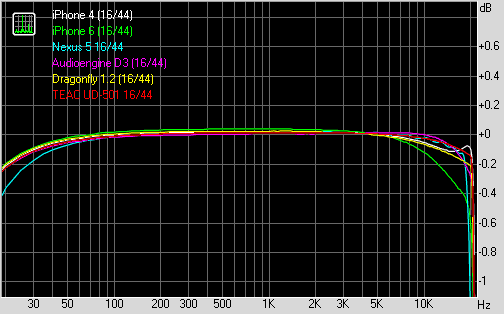 For sonic quality, therefore, the most important factor would be how well the headphone matches the amplifier. Assuming the iPhone 6 has an output impedance similar to the iPhone 5 around 5 ohms, a good ~40+ ohm set of high quality, high sensitivity headphones should provide excellent neutral sound. Not that lower impedance headphones would sound bad of course (most IEM's have low impedance for example), just potentially not as flat frequency response. I must say that I am impressed by how smooth the iPhone 6 is in use speedwise and the thinner profile with softer curves definitely feels very comfortable in the hand compared to the more chunky iPhone 4. It reminds me of the curved iPhone 3G but with a more "premium" feeling metal case. My wife loves it already. Finally... There is one significant feature I wish the iPhone 6 had - inductive charging. Both my Nexus 5 and 7 have this feature and has wide compatibility with Qi chargers. For the better part of a year now, I have not had to plug the Nexus phone/tablet into anything at all. Even if the iPhone 6 were a couple of millimeters thicker, I think this feature would be worth it! Over the past year, there has been speculation about when Apple might go "high-res" with iTunes. Considering that iTunes does not even offer lossless downloads currently, I certainly would not hold my breath! Furthermore, with the iPhone 6 capable of 24-bit but not higher samplerates beyond 48kHz, the idea of 88kHz+ music doesn't even seem to be on the horizon. Although I think lossless 16/44 iTunes would be a great idea, I believe Apple is smart not wasting their time in the high-resolution space for the masses. As I expressed previously, I believe "high resolution" audio will be a disappointment to most people after the novelty wears off; it just doesn't sound much better if at all given the same mastering. That's one issues. Another issue is that with devices like the iPod/iPhone/iPad, where there is limited storage space, you can already upload music in ALAC (I don't see why anyone should waste space with AIFF these days) if you really want. 24/96 is approximately 250% the size of the equivalent 16/44 lossless files, and 24/192 would be around 500% the size. Considering how little audible difference there is between high bitrate lossy (256-320kbps MP3 or AAC) and lossless already, it makes no sense to load up a portable device with all these huge lossless high-resolution files when there are so many other things the storage space could be used for (eg. movies, documents, apps, photos, books/magazines, videos...). When you factor in that the typical listener is likely to be enjoying music in suboptimal conditions like the subway, bus, car, walking around the streets, or exercising - having audio files taking up so much space just doesn't make sense. Using a 1kHz signal, measured open vs. 20-ohm load, the iPhone 6 has an estimated output impedance of 3.2-ohms. Just got on the AnandTech site. Nice to see they measured down to the 15-ohm load to demonstrate the limitations of the amp section. 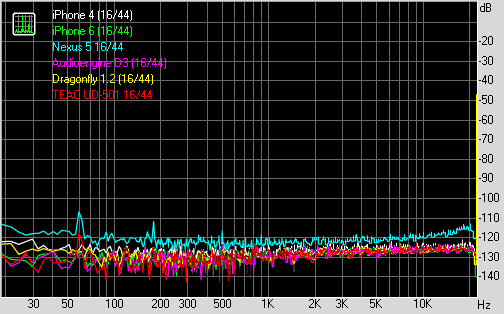 As suspected, 33-ohm load looks very reasonable and I would imagine 40+-ohm headphones would be optimal. A measurement with a real world load (i.e, earpods) would have been great to depict real performance for headphone listening. Nice read anyway. Thanks from Spain. True, a look at the output with real loads would be interesting since that provides a reflection of the combination DAC-headphone amp out of the phone. For my tests here, I was very much interested in the quality of the DAC and whether it could handle "high resolution" audio; along with a few of the other parameters I usually look for like accuracy of the Dunn J-Test and impulse response results. Hello Archimago, may I know where do you derive your jitter files? The arta generated files that I use for Jtest show the 0404 to have about 16ish bits of resolution in 24 bit mode. I'm not sure how/why ARTA would calculate 16-bits out of a J-Test... I'm not familiar with ARTA however. The resolution of the 0404USB is even better with XLR balanced output of course. 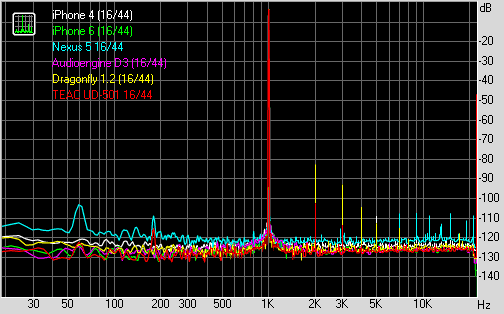 Have a look at the jitter spectrum of something like the TEAC UD-501 as an example of a low noise-floor DAC. Of course I'm not saying that this simple ADC is anywhere as good as a professional Audio Precision device but for a hobbyist who just wants a way to objectively compare a few DACs and answer some relatively straightforward questions, it's good enough to tell us things that no subjective listener would be able to claim with certainty. I'm a bit puzzled playing with alternative files, I admit that I'm not coding adept though. Thanks for your answer and the help. I do think now that ARTA is putting out 16 bit files for Jtest as well. I never used inductive charging and never understood the benefit. You still have to plug in your charging mat, right? I just use a dock, and I don't compromise on charging time. I usually rely on the online magazine journal before buying the technological products. As thet tell the actual picture of the products. Wasn't sure where to post this. I recently discovered your blog and am thoroughly enjoying and learning from it. Do you describe your test setup anywhere on your blog? I've looked and not found anything definitive. Is there a way to send a PM in Blogspot? If You are interested to Win Iphone 6 Online in India. Just answer a simple G.K based quiz and get a chance to win Iphone 6 or Iphone 6 plus in India for Free!! Cool ! 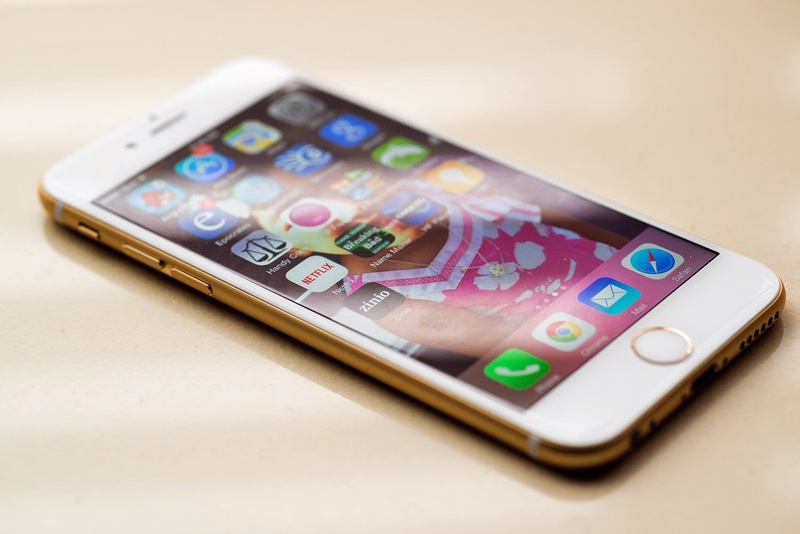 - Here is my guide about how i got free iPhone 6 as tester - http://goo.gl/FGt0r7 Good luck ! Great article! Cannot speak highly enough to the quality of the reporting. Easy read too! This is just a fabulous blog as I was looking for right information on Screen Cell Phone Repair and found your blog really awesome. It is true that Screen Repair for Cell Phones is a nice way to have a cut on the cost. There are a lot of companies that are selling Wholesale iPhone Replacement Parts, but finding one reliable is really hard. Thanks for your article and keep publishing more informative content!! One more chance to win a FREE iPhone 6 from win-a-iphone6.tk! Set out to be bolder with an iPhone more than ever – greater as well as better all around. The iPhone 6 give you control that doesn't cost you battery life, making it effective and perfect for dealing with all aspects of your life, wherever you discover yourself! 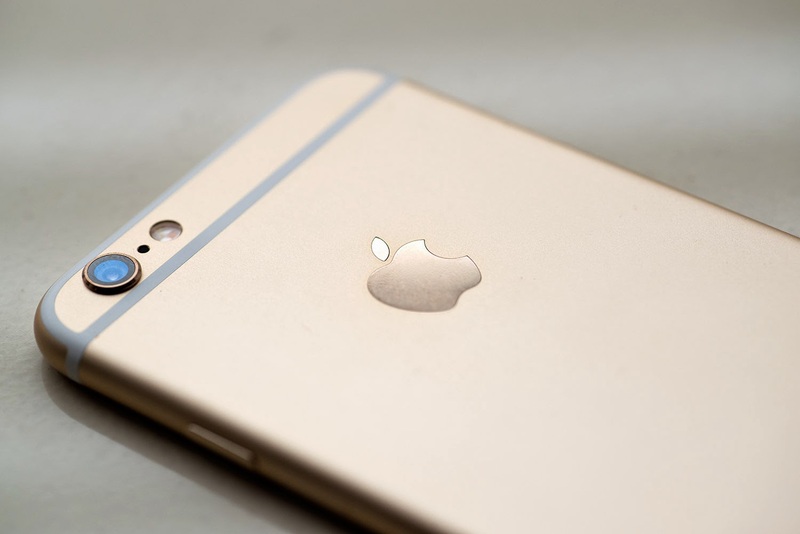 The Apple iPhone 6 has landed and it's just stunning! Loaded with shading, lighter & speedier, it's the best iPhone yet! A surprisingly thin outline now makes space for a bigger retina HD show, a speedier chip with ultra-quick remote and fanciful earphones, the rundown goes on! Take the following 60 seconds to enter and this extraordinary telephone could be yours soo. keep it up i hope i future you will post a more great blogs thanks . Here is another deal with all your needs. You should visit the link where you will get special discount. myQuetzal is a Smartphone Case Handler designed to give users their expensive device a sense of SECURITY and COMFORT when handling their phone. Nobody wants to drop their phone, and when you have a secure handle on it, iPhone 6s cases,you don’t have to. Dropping your smartphone is a common problem, something that every user experiences at some point in their life and it’s big business for phone repair companies stationed on just about every corner to meet the demand. A cracked screen is ugly and costly to repair and when you give it up for repair, the inconvenience of being without your phone can leave you feeling out of touch. Thank You so much for share such a Womderful article ! You looking Wholesale iPhone genuine parts & fix iphone issues to solve your iphone device problem from focusupply.com at affordable cost price. It’s difficult to find high-quality writing like yours nowadays. I really appreciate your blog!! Thanks for post it. good write up! What do you think about these studio headphones ? Very good job. Very informative! you can also dowlaod apple ringtone here. We offer hair transplant in India at Enahnce Clinics. Nice Information about apple technology, You may Also Like to Download Iphone Ringtones Free. Protect your iPhone in style with premium phone covers, best iPhone covers by caselogy.com in your budget ! Good to know the iPhone measurements. If you add mobile covers again length will increase. Smartphone cases or Mobile Covers come in many different forms such as plastic, leather or metal. You can purchase the best size cover because a wide range of numerous sizes and shapes covers are available in the market. They will be a perfect fit for your smartphone which will make your smartphone easy to carry and better in grip. Most importantly, smartphone cases or mobile covers are the most affordable way to give your smartphone a perfect protection which will allow you to avoid any kind of unnecessary fund expenditure or investment in repairing or replacing conditions due to bad handling. It will clearly save you a lot of money and it will increase the lifespan of your smartphone as well! Wow, I have been surfing the internet for more than two hours but I have not come across such a blog. The author has done some serious research and presented the findings of the study in a technical manner. I will definitely recommend this site to our clients who are majorly students who hire our Paid Project Reviewers to review their research papers. Wow!nice article and containing allot of information about the phones well done. If someone want to read more about that apple earpods I think this is the right place for you! If someone want to read more about that pelis I think this is the right place for you! Hey, thank you a lot for the effort and work you’ve put into your article. Great job! I’m still using an iPhone 6s and I’m. Very happy with it. Don’t believe, they changed the DAC to the 6-model. The one thing I’m wondering though is the following. For the 96/24 files you clearly showed on the graph, that the frequencies are cut above 20 kHz, hence the sample rate is converted down to 44,1 kHz. But eventhough you didn’t show a graph for it, doesn’t the same happen with the 48/24 files? 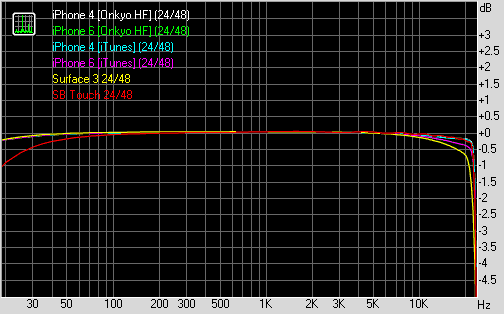 Isn’t 44/24 the best you get out of the native built in DAC? Would be happy for a short reply. And again, thanks for the great work. Hype Percents offers off white iPhone case with strap at affordable rates. The store includes various phone cases designs for your iPhone such as cases with strap, cute phone cases, soft silicon phone cases and much more. TEST: Archimago's LP Needle Drop Blind Test.